Based on the successful first edition, this book gives a general theoretical introduction to electrochemical power cells (excluding fuel cells) followed by a comprehensive treatment of the principle battery types - covering chemistry, fabrication characteristics and applications. There have been many changes in the field over the last decade and many new systems have been commercialised. Since the recent advent of battery powered consumer products (mobile phones, camcorders, lap-tops etc.) advanced power sources have become far more important. 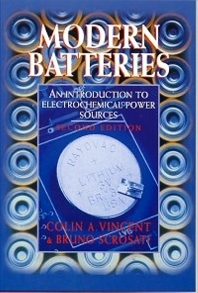 This text provides an up-to-date account of batteries which is accessible to anyone with a basic knowledge of chemistry and physics. Intermediate/senior undergraduates and postgraduates in chemistry, physics and engineering (especially electronic). Professional electronic engineers, electrochemists and physicists requiring a basic understanding of battery types. Introduction Theoretical background Primary aqueous cells Primary lithium cells Secondary lead-acid cells Secondary alkaline cells Rechargeable lithium batteries High temperature cells Miscellaneous cells.